We want pumpkin! To satisfy our craving, we asked holistic nutritionist and author of the food blog Healthful Pursuit, Leanne Vogel, for a pumpkin recipe that pleases the taste buds and nourishes the body. Success! 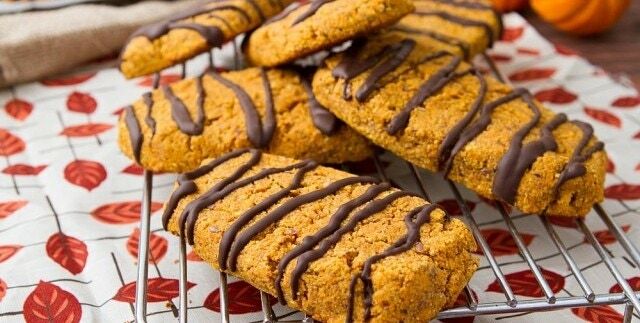 These gluten-free protein bars are filled with the goodness of pumpkin and a healthy dose of magnesium. 1. Preheat oven to 375°F and line a baking sheet with a silicone baking mat or parchment paper. Set aside. 2. Combine wet ingredients in a large bowl with a hand or stand mixer. 3. Whisk dry ingredients in a small bowl. Once incorporated, add to the wet mix and mix until smooth. Allow to sit for 1–2 minutes to thicken up. 4. Scoop approximately ? cup at a time into your hand. Shape into a bar and place on prepared baking sheet. You can also shape the bars on the baking sheet; I found that was easiest. 5. Bake bars for 22–25 minutes, or until toothpick inserted comes out clean, the bottoms of the bars are golden, and the tops are cracking slightly. 6. Remove from oven and allow to cool on the pan for 5 minutes before removing to a cooling rack. 7. Once cooled completely, then drizzle with melted chocolate.